An exceptional opportunity to acquire an exquisite five-bedroom family residence nestled in a desirable position with over 3 Acres. Boasting one of the finest approaches to a property we have seen in years and offering total privacy, with over 4000 sq. 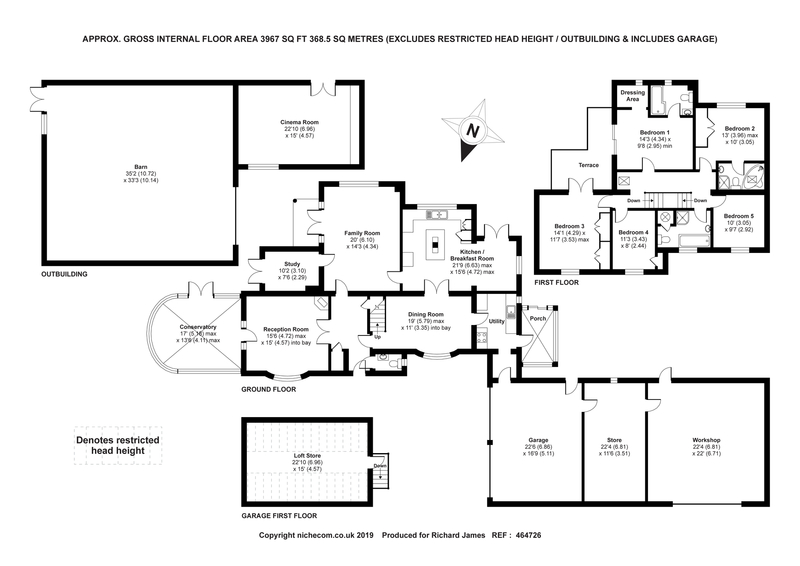 foot of accommodation, this wonderful home gives many options for a vast range of layouts and uses. In addition to the main house, there is: a Double Garage; Storage Room; a large Workshop; a Games/Cinema Room with Attic storage; and large Barn. The property is set well back from the road and is approached through a Cotswold Stone double -gated entrance via a long private driveway, bordering fields, which passes through a delightful wooded copse leading down to the house. The expansive living accommodation is arranged over two floors and provides fantastic flexibility including two stunning reception rooms. One room leads directly into the impressive conservatory and has a wood burner as its main feature. The other leads directly into the garden through double patio doors, creating a fantastic space for entertaining. Further to this, there is a Study and separate Dining Room. The Kitchen is fully fitted with granite/solid wood surfaces with large central work station which leads, open plan, into the Breakfast Room giving access via double doors to a Patio with Pergola over and a Summer House. The ground floor is completed by a useful Utility Room and Cloakroom with access not only to a small Conservatory/Porch area, but also to the Double Garage, Storage Area and Workshop. On the first floor are 5 bedrooms and 3 bathrooms; 2 of which are ensuite. A door from the Master Bedroom leads to a corner balcony giving stunning views of the surrounding grounds; Bedroom Three leads onto this shared balcony through double patio doors. The property is set well back from the road in a secluded position and enjoys over 3 acres. The grounds are mostly laid to grass which comprises four areas of lawn and wooded areas. There is also a kitchen garden with greenhouse, raised decking, a BBQ area and an outdoor Jacuzzi. To the front of the property there is extensive parking for numerous vehicles; overall, this property could be perfect for those with either classic cars or larger vehicles. A viewing is highly recommended to appreciate this stunning house.